My husband and I are huge nerds. Our combined nerdiness permeates every corner of our home. Shelves full of role-playing books, anime and super hero action figures, comics, manga, anime, board games, stuffed toys – well you get the idea. So really if Arthur wants to be anything but a nerd he’s in the wrong house. Yesterday my hubby and I took Arthur to his first anime convention. I desperately needed out of the house and Arthur desperately needed stimulation so off we went to get down with our geeky selves. Now anime conventions are really more my thing than Fred’s. He’s more of a sci-fi and game guy. 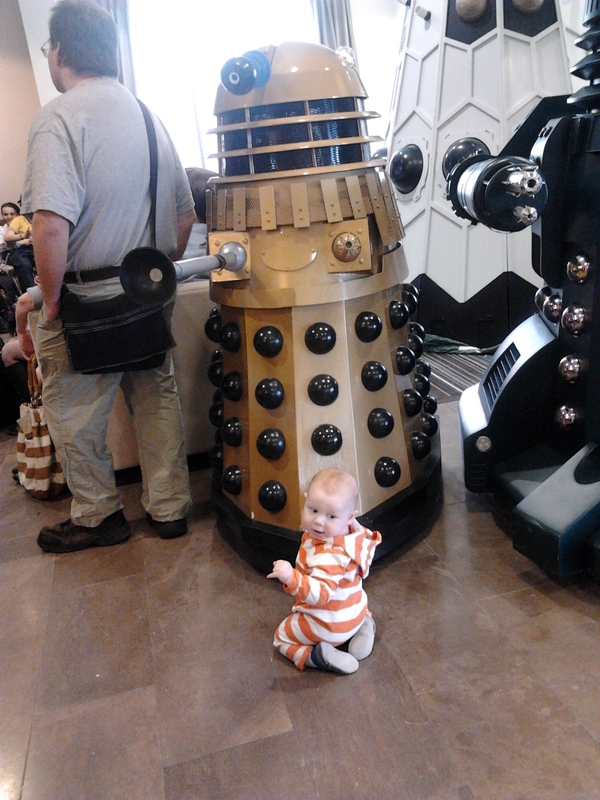 So lucky for him the Dr Who Society Of Canada was at this convention showing off their wares. We both LOVE Dr Who (new and old) and Fred always carries with him the sonic screwdriver I gave him last Christmas – 10th Dr. Y’know. Just in case. The Society had some Daleks there – they were life sized and AMAZING. They moved and talked and decided to make Arthur one of their own. He was fascinated by them and had to stop and watch whenever we saw them roaming the hallway. This convention also had some of the best cosplay outside of Anime North. 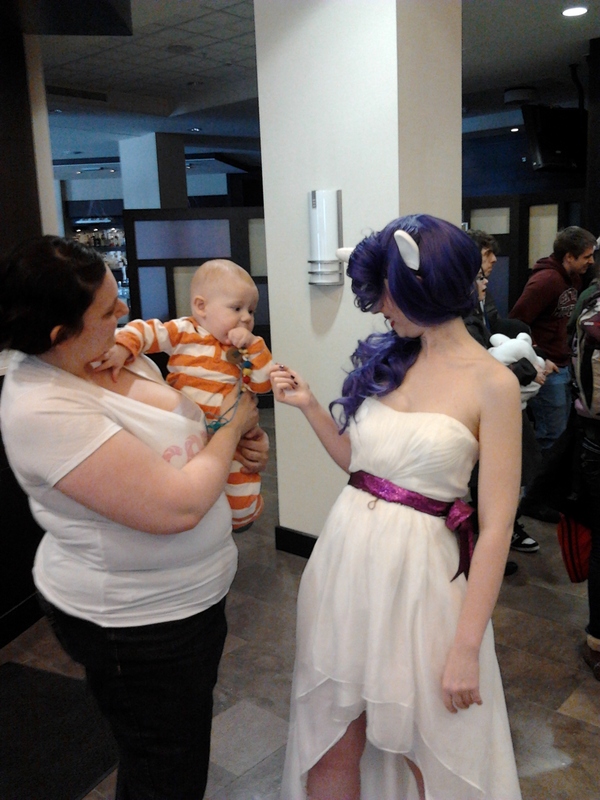 I especially loved seeing all the ponies – Arthur got his picture taken with this nice lady dressed as Rarity (mommy’s favourite). We spent the last two hours enjoying the comedy improv of the 404’s. Arthur actually fell asleep halfway through, and I didn’t have to leave at all. 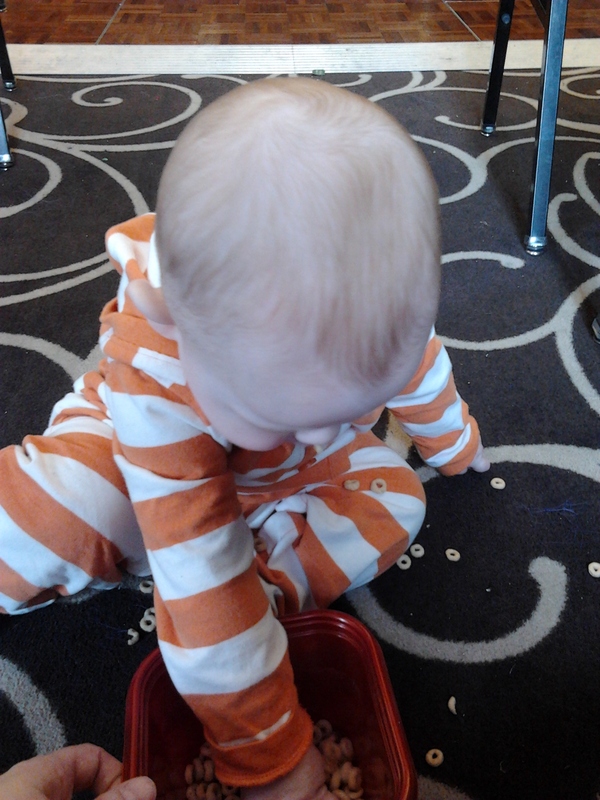 During the show he played/ate cheerios on the floor – we stayed in the back corner so he had room to move about. He had to take them all out to eat them one by one. It was a good day. Saw some people I hadn’t seen since going on mat leave. Got to chat and hang out with my brother for awhile. He made everyone who saw him smile and enjoyed seeing all the people in bright clothes. Next convention though I’m totally dressing him up. Then all uteri in the area will explode from the cuteness. I’m thinking Finn from Adventure Time. Or a small Dr Who. So many costume choices!